Applicants to a Casual Ward by Sir Samuel Luke Fildes, R. A. (1844-1927). 1874. Oil on canvas. Source: Thomson, p. 5. 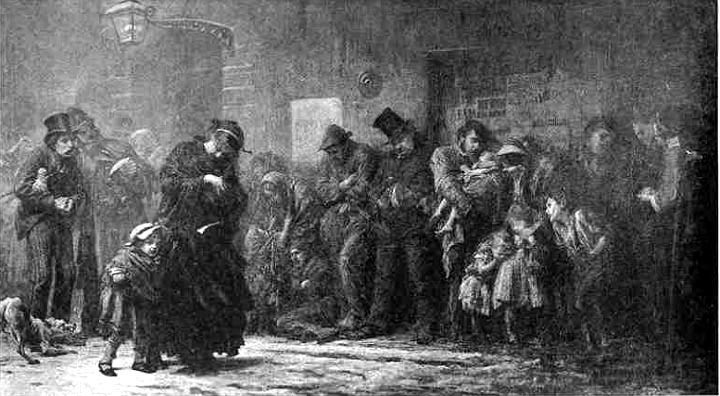 Compare Fildes' 1869 engraving, Houseless and Hungry, that appeared in The Graphic. It contains several figures that the artist reused: the man on the right part of the picture cradling his sick child, the man with top hat with his hands in his pockets, and the well-dressed woman the left, who is giving money to begging children. Thomson, David Croal. The Art Annual, 1895: The Life and Work of Luke Fildes, R. A. With numerous illustrations. London: The Art Journal Office (294, City Road, and 26, Ivy Lane), Christmas 1895. Treuherz, Julian. "Luke Fildes: 'Dumb, Wet, Silent Horrors" in Hard Times: Social Realism in Victorian Art. ed. Julian Treuherz. London: Lund Humphries, 1987. Pp. 83-89.